What are the best Brushes to use? You have all been told that only the finest Kalinsky Sable brushes made from the ermine cloaks of kings will do and that they must be size 00000 so you can paint a boil on a 6mm Generals nose. If you want to spend good money on a £5 brush with a short life span then knock yourself out. However, there is another way. Its heresy but I use synthetic fibre brushes. My preferred brand is the Windsor and Newton University series brush. I mostly use the size 0 with the size 00 and 000 for really fine detail. They hold a great tip and last much longer than an equivalent sable brush. It really is all about the tip. I can paint fine detail with the 0 alone and use far more of these than I do the 00 and 000 sizes. Even these are only used for fine detailing. All block painting, base painting, wash application and drybrushing is done with cheap Taklon flat brushes. I use sizes 4,6 and 12. 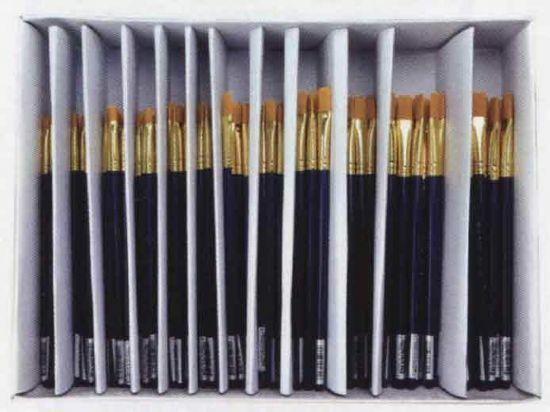 I buy dozens at a time and they do all the donkey work before my University brushes move in for the finesse stuff. White Nylon fibres with great points and a long life. 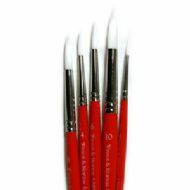 Cheap Taklon Flat brushes and larger size round brushes are used for the donkey work. Save your good brushes for the details.